Scroll to bottom for ordering information. 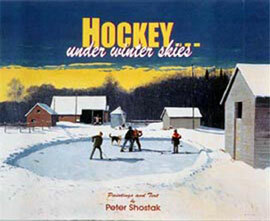 In HOCKEY…under winter skies, well-known Canadian artist Peter Shostak shares with us, through his paintings and stories, the game of hockey as he played it with his siblings and school friends. His experiences were not unique. The paintings honestly portray the game as it was played by many on countless frozen ponds, farm and schoolyard rinks. These hockey players played in the daytime, by the light of the low winter sun, and in the evenings, by the light of the bright moon and stars. They used homemade or store-bought hockey sticks and played with or without skates. Shostak’s nostalgic reminiscences and vivid paintings take us back forty or more years ago to a gentler, more simple way of life. HOCKEY…under winter skies will bring back a flood of memories for anyone who played under these circumstances. For those who have not, the paintings will provide a snapshot of what it was like to be a participant in a hockey game on one of those small patches of ice. Although days start to get shorter after June 22, this phenomenon is not really noticed until late September or early October. For a child growing up in Western Canada, the length of day is usually measured by the amount of daylight that exists from the moment one gets home from school until it gets too dark to continue most activities outside. Noticeably, this period of time rapidly decreases, culminating in the period between November and February, when there really is very little or no daylight. For most children, outdoor activities are a very important part of their lives. Not only are they required to attend to daily chores,but most play takes place within their immediate farm environment. 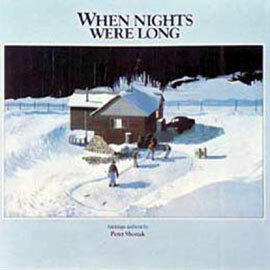 Peter Shostak’s paintings and text are based upon such experiences; hence, the title for this publication. Growing up on a farm, before the intrusion of television, meant that everyone was more responsible for his or her own entertainment. As a result, one’s family unit was very important. Neighbours were a mile or so away. Your brothers and sisters were your playmates and, if it was not too cold, your playroom was the outdoors. Much time was spent working and playing by the light of the moon and stars. 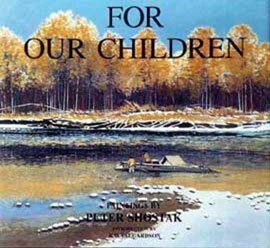 FOR OUR CHILDREN is a commemoration of early Ukrainian pioneer settlement in Western Canada. Well-known Canadian artist, Peter Shostak, devoted almost five years of painting to visually depict the experiences of these hardy people. The artist’s Ukrainian heritage has led him from theme to theme as he tells the story of rural life in Canada between 1891 and 1918. Although the entire series of paintings is based upon Ukrainian settlers, the experiences were common to all ethnic groups who homesteaded in Canada. Some of the illustrated themes in the book include: initial reaction of immigrants to life in Canada, travelling to the homestead, building the first shelter, living off the land, building a school, coping with illness and quarantine, and assimilation. 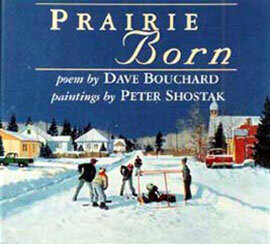 In PRAIRIE BORN award-winning author Dave Bouchard has teamed up with well-known artist Peter Shostak to once again explore in verse and image the prairie experience that is so cherished in the memories of countless North Americans. PRAIRIE BORN focuses on the passing of the seasons – spring, summer, fall and winter – and their effect on the people and the landscape. Dave Bouchard’s evocative text summons images that will be familiar to everyone with “the prairie in their blood.” Peter Shostak’s stunning paintings vividly evoke the essence of the prairie experience – hockey on a frozen pond, golden wheatfields beneath an enormous blue sky, long days of work under a blazing summer sun. This is a book that will stir warm memories for all those “prairie born,” no matter where they find themselves.